Receiving a timely reissue as part of the BFI’s tribute to German writer-director Rainer Werner Fassbinder, this devastatingly honest 1974 melodrama is one of the most beautiful films ever made, plain and simple. And plain and simple is how Fassbinder keeps it, documenting the ebb and flow of unexpected love. Sheltering from the rain, widowed Munich hausfrau Emmi (Brigitte Mira) finds herself in a bar frequented by Moroccan immigrant workers, among them the proud, taciturn Ali (El Hedi ben Salem). After a gentle softshoe to an old gypsy tune, the two fall into a chat, and eventually into bed. A tentative relationship begins, to the horror of Emmi’s grown-up children. As a story of two people bridging the cultural divide, ‘Fear Eats the Soul’ is as relevant as ever. Despite the apparent gulf between them, Emmi and Ali are complementary souls brought together by loneliness and understanding. But this is also a film about the gradual quality of social change – how time is needed for mistrust to mutate into acceptance. 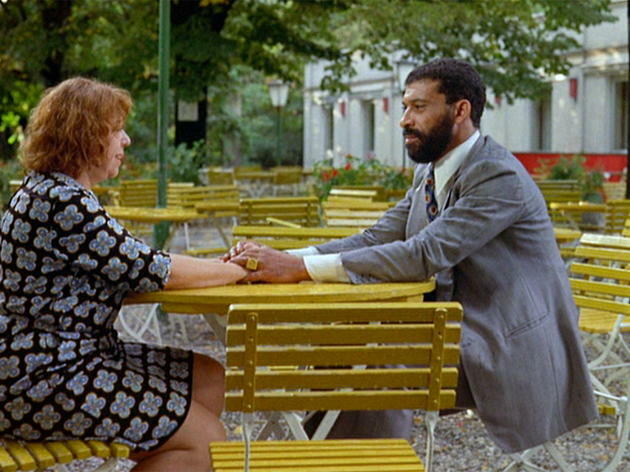 In the scenes with Emmi’s petulant family, Fassbinder speaks as much to the activist as to the bigoted, displaying a profound, optimistic faith in humanity’s ability to adapt and improve itself.